The Velvet Underground's debut album with the participation of Nico released in 1967 on Verve Records and produced by Andy Warhol. 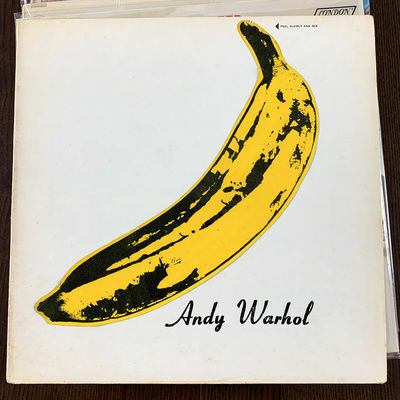 Original gatefold cover with the still intact Andy Warhol designed banana sticker and 1st pressing cover with Eric Emerson's torso image placed upside down on the back cover. The rarest of all of the cover versions, after Emerson threatened the label with a lawsuit the company started covering up the torso image with a black sticker. During March and April of 1967 this cover was being withdrawn and reappeared for sale only a few months after with a black sticker covering the torso of Emerson on the back cover. Only few of these uncensored covers with the uncovered torso show up for sale. Don't miss your opportunity to acquire this album. Additionally, this album is a Mono release, much rarer than the Stereo version. This copy was pressed on the East Coast and contains a timing mistake on the "I'll Be Your Mirror" song on side 2 label. The dead wax area has the following handwritten matrix numbers: Side One - V5008 Side 1 MG 558 rev Block-shaped 'S' / Side Two - V5008 Side 2 MG 559 symbol. The cover is in wonderful condition, only containing some light yellowing and age spots on the edges and corners. The unpeeled banana sticker contains only a few creases and scuffs, but remains fully intact. The majority of these covers have splits and a pretty severe ring wear, but not this copy, only containing a few signs of ring wear on the back cover at the top and bottom and some light scuffing. Bright interior has only a few yellow spots. The cover has been preserved very well due to the great storage conditions. The vinyl is in Very Good Plus condition with some light surface marks and scuffs.